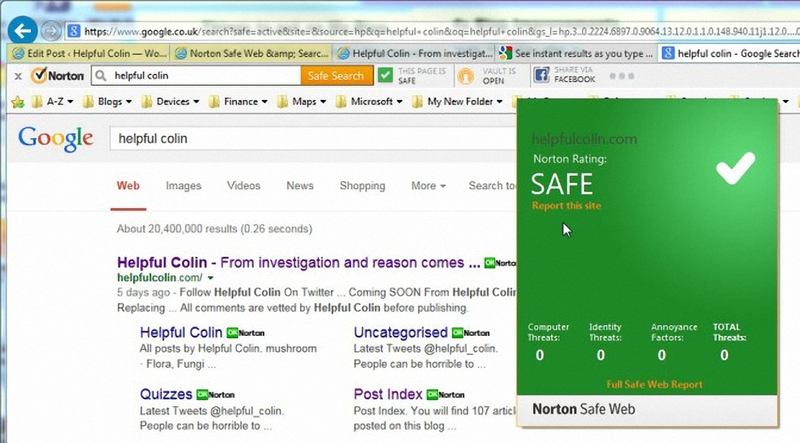 While updating software on a friend’s Windows 8.1 PC he remarked that he could no longer see the Norton Safe Web (NSW) icons in his search results. He was using Internet Explorer with Google as his home page and search engine. He had Norton Internet Security (NIS) installed and the Norton Toolbar was present in his browser. At the time I couldn’t find a solution to his problem so I came home and conducted tests on my Windows 7 PC which also uses NIS. The featured image at the top of the page shows how it looks when it works OK and an NSW icon is selected.